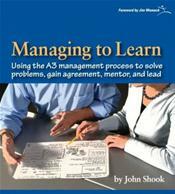 Managing to Learn by Toyota veteran John Shook, reveals the thinking underlying the vital A3 management process at the heart of lean management and lean leadership. Constructed as a dialogue between a manager and his boss, the book explains how A3 thinking helps managers and executives identify, frame, and then act on problems and challenges. Shook calls this approach, which is captured in the simple structure of an A3 report, the key to Toyota's entire system of developing talent and continually deepening its knowledge and capabilities. The A3 Report is a Toyota-pioneered practice of getting the problem, the analysis, the corrective actions, and the action plan down on a single sheet of large (A3) paper, often with the use of graphics. A3 paper is the international term for a large sheet of paper, roughly equivalent to the 11-by-17-inch U.S. sheet. A unique layout puts the thoughts of a lean manager struggling to apply the A3 process to a key project on one side of the page and the probing questions of the boss who is coaching him through the process on the other side. As a result, readers learn how to write a powerful A3--while learning why the technique is at the core of lean management and lean leadership.